The Last of the Jubblies is a compilation of unreleased music by the progressive rock group, England. England produced the Garden Shed album for Arista Records in 1977 and continued to record new music throughout the late 70s. 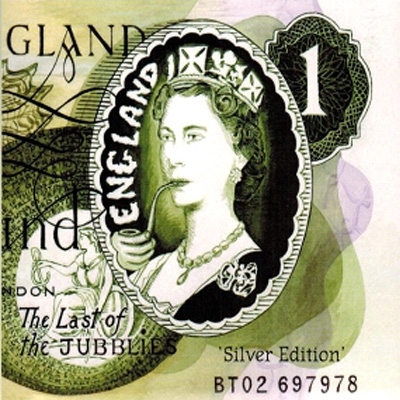 As a result of worldwide interest in England‘s music, The Last of the Jubblies was released in 1995 on CD. Subsequently, progressive music fans have labelled The Last of the jubblies as England‘s second album: a claim which is partly true since four of the tracks were written and recorded immediately after Garden Shed (in the winter of 1977) as ideas for an album. However, other recordings were included on the 1995 CD which were felt to be of interest. These were: Nanogram (1976), Mister Meener (1976). This >Silver Edition< of The Last of the Jubblies album continues in the spirit of the 1995 release by including two >bonus recordings< from 1977, which have never before been published, and a third track, Hotel Live (extract) from the band‘s concert performance in Tokyo in 2006. This is feasible because Nanogram has been omitted from this edition as it was included on Green Tree‘s >Golden Edition< of Garden Shed, published in 2015. This album is therefore seen as a complement to the >Golden Edition<. Creepin’ Instrumental 6:32 A One-Legged Day Tale 8:58 Tooting Bec Rope Case 8:41 Mister Meener 3:35 Ridge Farm 8:24 Flying Saucers 5:24 Sausage Pie 5:14 Hotel >Live< (Extract) 6:38 Total: 63:36 Min.